.264 Winchester Magnum ammo is a hot little round that finds its parentage in the legendary .375 Holland and Holland round. Winchester decided to take the mighty .375 H&H and build a stable of short-cased, belted magnum cartridges. 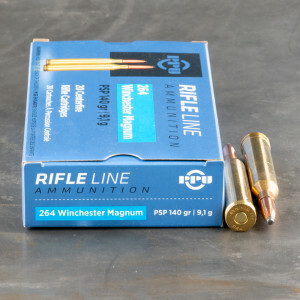 Because it sports a 6.5 mm projectile, the .264 Win Mag utilizes the superb ballistics of the 6.5 mm family of bullets to wring out impressive performance. The round was intended to be a capable performer on large Western deer and elk. And it is! Able to push a 140 grain bullet approaching the south side of 3,000 feet per second, it pretty much equals and maybe bests by a bit a .270 with the same 140 grain bullet yet using projectiles with much better ballistic coefficients. At one time, there was criticism that the .264 was tough on barrels. That criticism seems to be lessening, maybe due to better barrel materials and manufacturing. But, if you're just using the caliber for hunting, barrel life is not likely the most important item on your plate! A number of great manufacturers offer loaded ammo for the round with 130 and 140 grain bullets being the most popular. I haven't shot any of them yet, but the service and speed of shipping was great as usual with Ammo to Go. Excellent quality ammo and performed well giving excellent groups. I'm sure it will perform well on game. Great ammo!